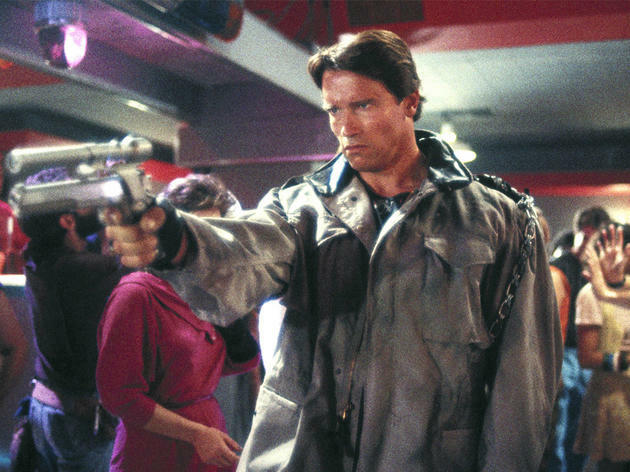 Back from the future in which the machines rule comes a rippling robot (Schwarzenegger) who terminates opponents with extreme prejudice (like ripping their hearts out). His goal is to kill a woman (Hamilton) destined to bear the child who will become the great freedom fighter of the future. Fortunately she has a champion in the shape of another time traveller, Arnold's all-too-human opponent (Biehn). The gladiatorial arena is set, with vulnerable flesh and cunning versus a leviathan who totes around massive weapons like so many chic accessories and can rebuild his organs as they get shot away. The pacing and the action are terrific, revelling in the feral relentlessness which characterised Assault on Precinct 13 and Mad Max 2; even the future visions of a wasted LA are well mounted. 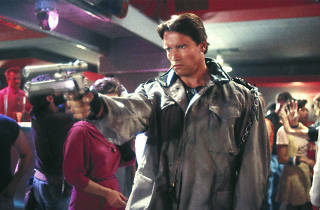 More than enough violence to make it a profoundly moral film; and Arnold's a whizz. CPea.